Imagine, if you will, a galaxy moving rapidly through space, minding its own business, when all of a sudden it feels a gravitational tug. It turns out it has come under the influence of a neighboring galaxy. Drawn inexorably closer to each other, it is not long before these two galaxies collide, their stars whizzing by each other and the gas and stars inevitably pulled out in a trail as the galaxies move through and beyond each other. These streams of gas and stars, left behind as evidence of galaxy interactions, are called tidal tails, as they are caused by the gravitational interactions, or tidal forces, as the two (or more) galaxies pass through each other (see a really cool galaxy collision simulation here.) Understanding what tidal tails are made of can give us valuable clues about the effect tidal interactions have on merging galaxies. Therefore, understanding the makeup of these debris trails is important! Interacting galaxies stir up the gas in the galaxies, compressing it and triggering the formation of new stars. However, not all the stars in the tidal tails have to be new – older stars that already existed before the interaction may have been pulled out along the tail with the gas. This means that an older population of stars may exist side-by-side with the newly forming stars. Whether or not this actually happens has not yet been figured out, and the authors of today’s paper are aiming to do just that. 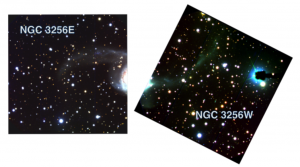 Figure 1 Images of the two tidal tails of NGC 3256. One is referred to as the Western Tail, denoted in the image with a “W”, and the other is the Eastern tail, represented by an “E”. The authors have chosen to study the two tidal tails belonging to the galaxy known as NGC 3256, as shown in Figure 1. This galaxy is 38 Megaparsecs (120,000,000 light-years) away, and it has been about 400 million years since its interaction with another galaxy. The observations were taken with the Gemini Multi-Object Spectrograph (GMOS) Imager on the Gemini-South Telescope, located at the summit of Cerro Pachon in Chile. Several different filters were used to take the images of the tails. These filters gave the strength of the light from the tails in different wavelength ranges. From these filters, the authors were able to calculate the color of each tail. Astronomers define color as the difference between the brightness of an object in two different filters. Since young stars tend to be bluer than old stars, comparing the colors of the tidal tails can indicate whether the stellar population of one tail is younger than the other. Using the u, g, r, and i filters, which measure emission from bluer to redder wavelength ranges, the authors calculated the u – g and r – i colors for the tidal tails of NGC 3256. They found the that Western tail is bluer than the Eastern tail, indicating that the Western tail has a larger population of younger stars. In this tail, the stars are estimated to be 288 million years old. Since the original galaxies merged 400 million years, this means that the majority of stars in the Western tail formed after the interaction. They were likely star formation triggered by the gas compression as the galaxies moved through each other. The Eastern tail stellar population is 841 million years, indicating that most of the light from this tail is dominated by older stars that originated in the original host galaxies. The authors of this paper succeeded in characterizing the stellar populations, both younger and older components, of these twin tidal tails. Understanding that both new star formation as well as stars carried along the tail through the galaxy interaction coexist in these tidal tails will inform future work on how galaxy interactions and mergers proceed and affect the final stellar population of merged galaxies.